If you’re reading this, you are likely not a “digital native”; you’re a “digital immigrant,” like me. While I don’t love thinking of myself this way, it’s true: when I bought a computer in my freshman year at college, it was the first Apple with a built-in hard drive (so fancy! ), which means I was already an adult by the time I truly had unlimited access to computers… and there was no internet, either. The moment that we as a species truly crossed over into true “digital life” is generally marked as 2008, when the iPhone was introduced, since it was the first smartphone to achieve significant market saturation and thus connected millions of people to the internet — and to each other! — anywhere they went. Children born after 2008 have been christened “iGen” by Jean Twenge, a psychology professor at San Diego State University., who named her recent book after them: iGen: Why Today’s Super-Connected Kids Are Growing Up Less Rebellious, More Tolerant, Less Happy–and Completely Unprepared for Adulthood–and What That Means for the Rest of Us. She argues that the way they think and exist in the world is fundamentally different from everyone before them — and she has the graphs to prove it! 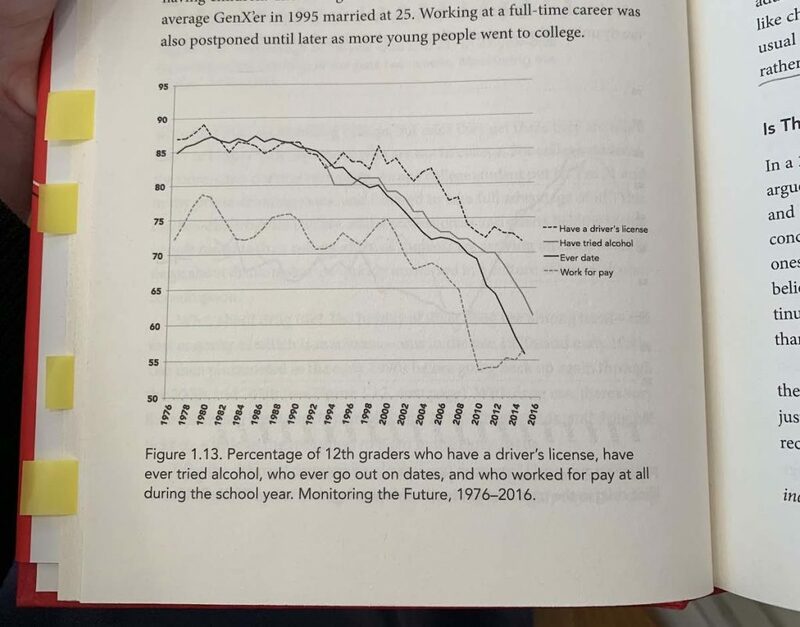 Her graphs also reveal a sea change that may help explain why parenting these children can be so difficult and confusing for us, their parents. Evidently, they do not share our understanding of the milestones on the journey to adulthood. While this may sound like an abstract or academic exercise, it’s not: it’s a map showing us the reason our children may seem so alien to our own experience of adolescence. For example, Gen X parents (born between 1966-1981) recognize the following as some of the markers of being a “grownup”: having a driver’s license; trying alcohol; asking someone on a date; and having a paying job. These are common milestones that nearly all adolescents pass on their way to adulthood. Interestingly, they are the same markers that our parents (Boomers, born 1944-1965) and even our grandparents (Matures, born 1943 or earlier) recognize. Each of these behaviors is an indicator of independence, and requires the confidence to take a risk of some kind, whether social or economic; our successes and failures at these efforts came in manageable, bite-sized pieces, and were meaningful teaching moments at a time when we were trying to form our identities. Though we may have complained about a generation gap when we lived at home with our own parents, it’s nothing compared to the generation chasm we are trying to parent across in our own homes today. Here, Twenge’s data shows clearly that iGen kids (shown in grey: born 2000-2017) are much less likely to engage in what we thought were markers of adulthood. In “real life,” that looks like a kid whose life is wholly different from our own teenage years. If you ask a tween in your house if they’d like you to take them to the mall with their friends, you’re likely to hear an utterly puzzled, “Why?” in response. In their lives, purchases originate at a laptop and arrive in cardboard at their house in a couple of days (so who needs the mall?). They also don’t see the point of driving somewhere to hang out when they can spend plenty of time together virtually, slaying dragons or exploring new worlds — or even watching cat videos. My own parents would have gone “cruising” — driving up and down Main Street in town to see and be seen — but this, too, is nonsensical to kids who don’t have driver’s licenses, to begin with. It stands to reason, then, that those of us only holding visas to the digital world see its natives as very foreign creatures, indeed. The way they spend their time and the things they aspire to don’t make much sense to us — in fact, we have more in common with our own parents and even our grandparents than we do our own children, in many ways! Turning our children loose in the digital landscape feels a little like dropping them off on a street corner in Taiwan — where you have no currency or maps, and are unable to speak or read the local language. The situation described above is common to most families today, but parents of gifted children know that today’s technology-saturated world can be an especially difficult place to parent. For instance, their characteristic intellectual curiosity benefits tremendously from access to “all of the world’s knowledge” all at once, allowing them to feed their hungry minds, but it can also be overwhelming in several ways. Intellectual overexcitability encountering information that fascinates them is a recipe for overthinking — never being able to STOP reading or clicking, because what if the next thing they click is super-fascinating and the best thing ever? FOMO (Fear Of Missing Out) is a real psychological phenomenon — in this case, it’s anxiety that there may be even better information just beyond the next click, but they won’t get to see it if they stop because of something as mundane as, say, sleep…or dinner…or school. Unfortunately, though we all know intellectually that there is no “end” to the interwebs, sometimes it’s hard for children to truly understand that and stop themselves at some point. There’s another wrinkle, too, which makes it difficult to know how to best parent this generation who lives so much of their lives online: opportunities for social interaction. Online relationships may be especially valuable for gifted children for two reasons. First, the experience of a gifted child in school is not always a positive one, and the virtual world can provide another, larger venue to find friends. Second, it is not uncommon for these children to have interests that tend to the esoteric or which are not of interest to other children their age, and thus online communities devoted to these topics may be the only place to find like-minded people with whom they share a passion. Do these opportunities to connect with others “count” as friendships, even if they’re not in-person interactions? Wondering about this very question, I contacted Professor Marco Iacoboni, who leads UCLA’s Brain Mapping Center, to ask if there is an biological, observable difference between the way mirror neurons act during in-person versus online conversations. He is one of the preeminent experts in the world on mirror neurons, those specialized cells in the brain that encourage us to cement social connections by behaving like the other humans around us (e.g., yawning or smiling), because evolution says we need them. (After all, you can’t eat that whole mammoth by yourself.) Professor Iacoboni confirmed that mirror neurons do not behave precisely the same way when conversants are online as when they are face-to-face, but — and this is an important “but” — online connections are not without value, especially if the alternative is social isolation. He theorizes that talking to someone else in person implies a commitment to that person, if only briefly, while online connections do not require that same kind of implicit social contract. Unfortunately, that answer only complicates matters, since online time might be the a gifted child’s most valued social outlet. But we also know that the online world is chock-full of hazards, in the form of social media cyberbullying, predators of all kinds, and inappropriate content — so it’s also a wide-open field littered with landmines. What’s a parent to do in these circumstances? Common Sense Media — a nonprofit site which provides details about content in children’s reading material, movies, and video games; exhaustively lists incidents of violence, sexual behavior, commercialism, positive messages, and language. They also have a remarkable survey of teen & tween media use which can spark valuable conversations in your house about expectations and responsible use, as well as an enlightening series of ongoing pieces about the way children use technology. Healthy Children.org — operated by the American Academy of Pediatrics, this site can help you have a productive conversation about what kinds and amounts of media are acceptable for your family. The American Psychological Association — publishes an annual study called “Stress in America,” part of which focuses specifically on iGen (aka “Gen Z”) and included enough data on technology, specifically, that they split that off into a second report called “Stress and America: Coping with Change, Part 2: Technology and Social Media,” which includes both insights about how adults use technology and strategies that people use to manage their use of technology. Life in these technology-saturated times can be confusing, especially for those of us watching our children confidently (if naively) brave the online seas, eagerly searching for new horizons. The good news is, you don’t have to be a “digital native” or keep up with the latest memes to parent your child effectively. Yes, they will always understand more of this world than we will — but no matter how great they are at navigating the web, you have the benefit of life experience that has sharpened your critical thinking and judgement. You can use the power of your brain to teach your brilliant children how to make good choices for themselves online — and perhaps even learn a thing or two from our digitally-native children. 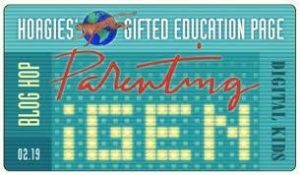 To read more from incredible bloggers on this month’s topic, visit Hoagies’ Gifted Education Page Blog Hop! Thanks for the insight! Glad to know there’s some value in online interaction, even if it’s less. Great article, with very helpful suggestions for all of us digital “immigrants” just trying to help kids and young adults pace themselves! I love these resources and go to Common Sense Media, especially, frequently, thanks!